If you have never before heard Swasie Turner speak in public then you are missing a real treat. 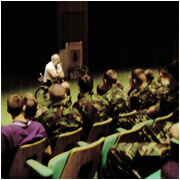 Compelling and often very moving stories (supported by slides and photographs from his laptop) are told to captivated audiences all over the land. Whether the audience is a small local group or a large corporate gathering, Swasie is only too pleased to take centre stage. If you would like to invite Swasie along to your venue (England, Wales and Scotland) the please email him. There is no fee charged, however, due to unprecedented demand he has had no alternative but to ensure that his travelling expenses are now covered by the hirer (in addition to a charitable donation).